PARLIAMENTARY SUPPORT: Former Liberal Democrat MP for Wells Tessa Munt and her Conservative successor James Heappy join dairy farming protesters outside the city’s Morrisons branch, to support the protest the emptying of shelves of milk to highlight the devaluing of their product through loss leading. Picture by Jon King. 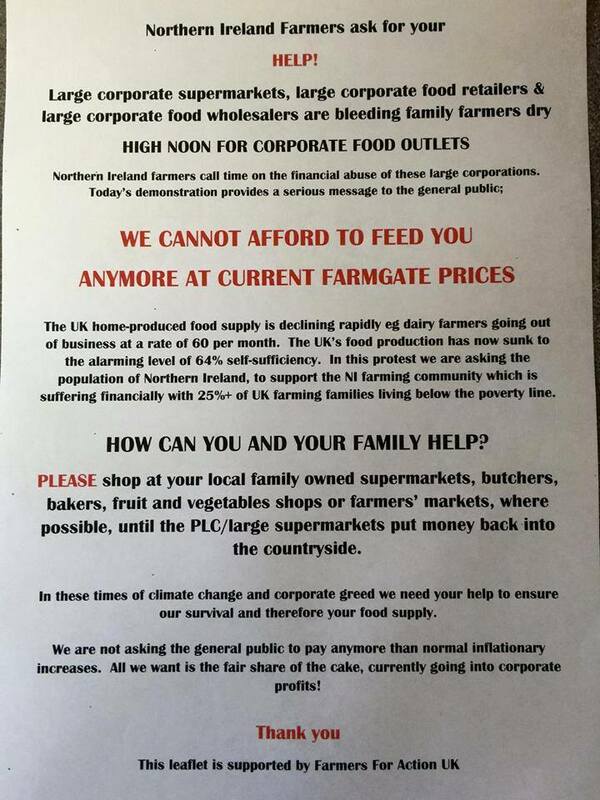 PUBLIC APPEAL: This was a leaflet that has been handed out to supermarket shoppers in Northern Ireland. WEST country farmers and others have been emptying shelves of milk and lamb in supermarket chances to show consumers what would happen if they were not there to produce it. This is a scene being repeated right across the country from Ayr in Scotland, Shropshire and Somerset and Cornwall. Supermarkets that have been targeted include Asda, Sainsbury’s and Morrisons. One video posted amongst many in a social media frenzy shows Ed Parsons protesting to a Morrison supermarket branch security guard telling him in no uncertain terms that his job would ultimately be at risk if the continual campaign to loss lead essential grocery items such as bread, cheese and milk wasn’t underpinned by action to treat their suppliers more fairly. Speaking to the security guard, who is off camera, Mr Parsons tells him: “This is a protest about the way your suppliers and everyone are paying us. Have a word with the people above, see what you can do. If you don’t look after us, we won’t be able to make it and you won’t be able to get any of it anymore, all right. 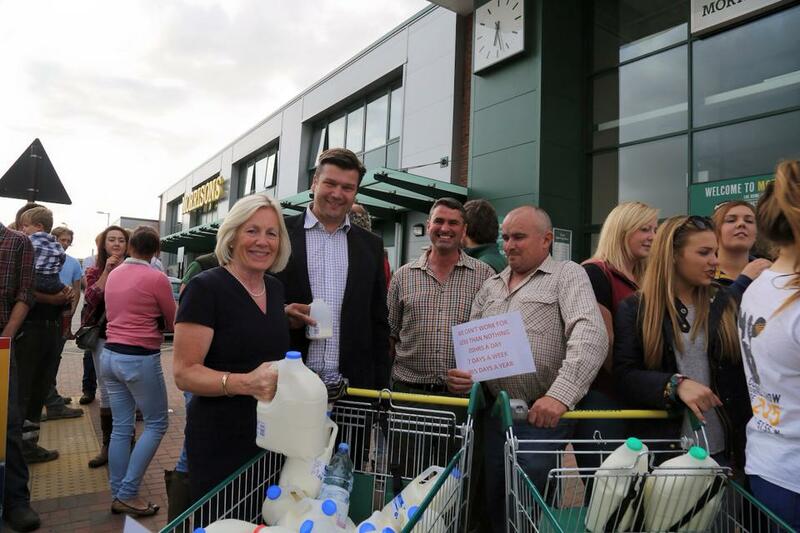 To the consternation of Morrison’s in Wells, dairy and other farming protesters were joined in the milk “trolley dash” challenge by former Liberal Democrat MP for Wells Tessa Munt and current Tory MP James Heappy. In another separate protest up north Amelia Lynch posted an update on a group of farmers, who should be being paid 24-28 per litre for the cost of production, but in some cases this was as low as 7p. She said: “I think you will agree this is absolutely shocking. We cleared the shelves of all the milk with the grand total coming to £600 and this was kindly donated by an anonymous source. “We protested peacefully but the police were called, however no action was taken due to the peaceful nature of our protests. We then distributed the milk outside to the public while telling them why we were campaigning. In a separate development North Wales farmer Gareth Wyn Jones, although not from the Dorset, Somerset and New Forest area, posted another social media video clip (not You Tube I’m afraid), suggesting the idea of a traffic-light style food labelling system, and he is seeking support from the farming community and the wider public to back such a scheme. 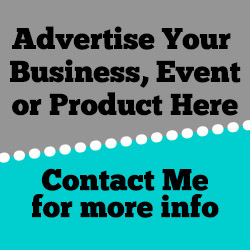 “I’m slightly annoyed going around the supermarkets and seen some of the misleading labelling they’ve got. What I would like to see is a colour code. A three-bar colour code so we could let’s say have red for all imported produce, including all the packaging and labelling. “For anything that is produced and packaged in Great Britain, let’s have it green and everything (packaging etc) in green so people can understand and for everything in the EU, let’s have an amber colour.